By buying this product you can collect up to 17 loyalty points. Your cart will total 17 loyalty points that can be converted into a voucher of € 3,40. 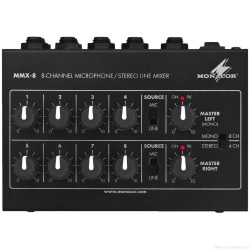 The automatic microphone mixers of the CS series are THE tool for multi-microphone concepts, e.g. prevailing in conference rooms or boardrooms, churches or language laboratories. 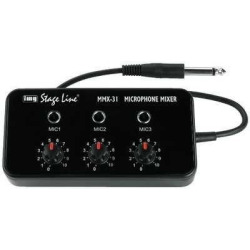 The main task of these mixers is to activate microphones whenever required and deactivate them again when a speaker has finished his/her presentation. 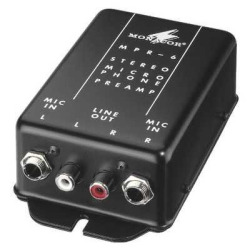 This intelligent control of the individual microphone channels is completely silent and very precise in order to hear every syllable of the speaker. The benefits for the overall sound are profound: the acoustic feedback and background noise are minimised, resulting in a clear and transparent sound. The CS mixers feature a last-in function for maintaining the room atmosphere and for giving a sound impression that doesn't appear to be cut off suddenly. A light ambient sound is also maintained during conversational breaks. Three operating modes can be selected, allowing for most versatile applications: automode (one channel at a time), priority mode (accessing and interrupting a microphone which is currently in use), 4/1-channel or 8/1-channel mixer (simultaneous use of all microphones). The threshold for the automatic mode can continuously be adjusted. 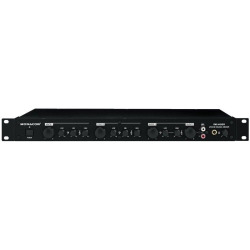 Futhermore, each balanced XLR input can be configured via a switch for the application of line sources (CS-8 with additional stereo RCA input). 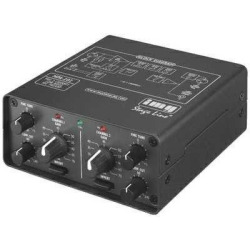 A channel-selective +12 V phantom power supply (CS-8: +48 V) is available for the condenser microphones. 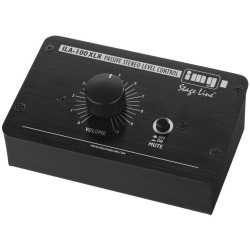 The balanced mix output can also be switched from microphone level to line level. External units, e.g. 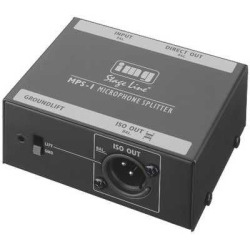 warning devices, cameras or speakers can be controlled via the +5 V TLL trigger outputs as soon as a certain channel is recognised as being active. An LED indicates the activity of the individual channels. In order to increase the number of channels, several units can be combined with each other via link connections.